Taking Offspring Number One off to Manuka to get a bit of the benefit of having the French Film Festival in town was quite an experience! I haven’t been to this cinema in years, and it hasn’t changed at all (even the popcorn tasted like it might have been there since my last visit!). But this film made it all worthwhile. La Guerre Des Boutons (or The War of the Buttons for those who are too lazy to figure that out!) proved an excellent choice given that we don’t have time to see more than one this year. But really, how could you go wrong with any film in a French film festival? The premise is simple; gangs of boys from two rival country towns in walking distance of each other elevate a long-standing tradition of conflict to all out war in which the greatest victory comes by the ceremonial removal of the buttons from the opponents’ clothes. It may not sound all that terrifying, but the wrath of a French mother towards a son returning home with no buttons is nothing to be scoffed at! The film is a romp, but in that inimitable French style, the humour is offset by some brilliantly crafted characters, whose more human side is shown as the impact of the Algerian War is felt in the town. 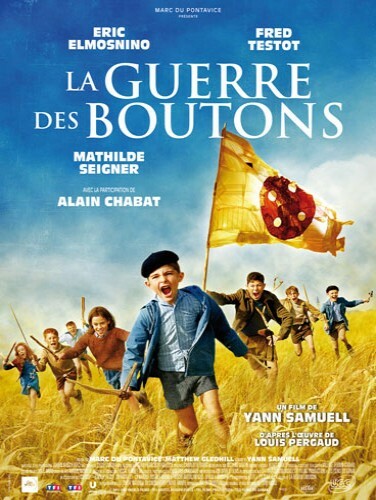 The balance between humour and the film’s more serious themes is impeccable, making La Guerre des Boutonsa film for all ages.